Are you tired of worrying about what people think of your smile when you meet them? Have you forgotten when the last time was you smiled with confidence? When you have crooked teeth, the appearance of your smile is always on your mind, and it can take a toll on your confidence. 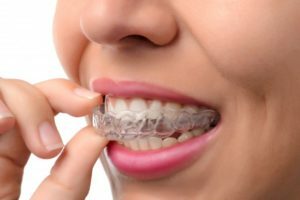 If you’ve considered straightening your teeth, but the idea of wearing traditional braces is holding you back, Invisalign in East Islip may be the solution for you. Here’s how it works. Invisalign uses a series of clear plastic aligners to apply gentle pressure and gradually move teeth. The aligners are created specifically for your teeth and they change every two weeks according to your treatment plan. They should be worn for at least 22 hours every day to achieve the results you want in a timely manner. Invisalign in Islip offers many benefits that help busy adults fit treatment into their schedules and achieve their goals for their smiles. Because the aligners are clear and snug fitting, they are virtually invisible and don’t interfere with your normal daily activities. Since they can be removed, you’ll still enjoy all the foods you love during treatment with Invisalign. Brushing and flossing will also stay the same so you can take great care of your teeth during your treatment. Invisalign is very efficient with most cases being completed in 12 to 18 months. It also requires fewer visits with your dentist because aligners can be changed at home. Your dentist in East Islip can determine if Invisalign suits your needs during a thorough examination. X-rays and photos of your teeth are taken to create your treatment plan, and 3D imaging allows you to see what you smile will look like when it’s completed before you ever start treatment! If you are ready to learn more about the possibilities of Invisalign for your smile, contact your dentist today to schedule a consultation. Dr. Gary Rosenfeld has been serving patients in East Islip, NY for more than 30 years. He’s comprised a team of dedicated dentists who take care of patients 7 days a week with both morning and late evening appointments. No matter what your needs are, East Islip Dental Care can accommodate them with a convenient appointment and comprehensive dental care. If you would like to contact East Islip Dental Care, we can be reach by calling 631-581-8600 or online through our website.